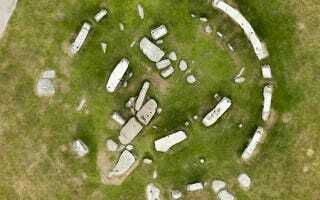 Though archaeologists have long suspected that the huge neolithic stones of Stonehenge once formed a complete circle, evidence in support of the claim has remained elusive. Now, owing to a spat of dry weather, the mystery appears to have been solved. Stonehenge's current configuration is that of an incomplete circle. In an effort to prove that it was once complete, historians have performed countless high resolution geophysical surveys and excavations, but with no luck. Now, thanks to a dry summer and a watering hose that was too short, the answer has unexpectedly emerged in the form of ghostly outlines — patches of parched grass where the megaliths once lay. Usually, the ground around the ancient structure is watered by stewards, but this year their hose was too short to reach the entire site. Quite by chance, the incomplete section of the inner stone circle was left to dry out. Staff only water the site during the driest weeks of summer, but the hosepipe doesn't reach to the south-west quadrant where there is a gap in the circle. Worker Tim Daw spotted the patches on the ground - now thought to be 'stone holes' - where the grass was more parched. He said: "I was standing on the public path looking at the grass near the stones and thinking that we needed to find a longer hosepipe to get the parched patches to green up. "A sudden light-bulb moment in my head, and I remembered that the marks were where archaeologists had looked without success for signs that there had been stone holes, and that parch marks can signify them. "I called my colleague over and he saw them and realised their possible significance as well. Not being archaeologists we called in the professionals to evaluate them. "I am still amazed and very pleased that simply really looking at something, that tens of thousands of people had unwittingly seen, can reveal secrets that sophisticated machinery can't." The patches are considered compelling evidence because archaeological remnants which have been buried in the ground for extended periods are known to affect the rate of grass that grows above them, even after they've been removed.